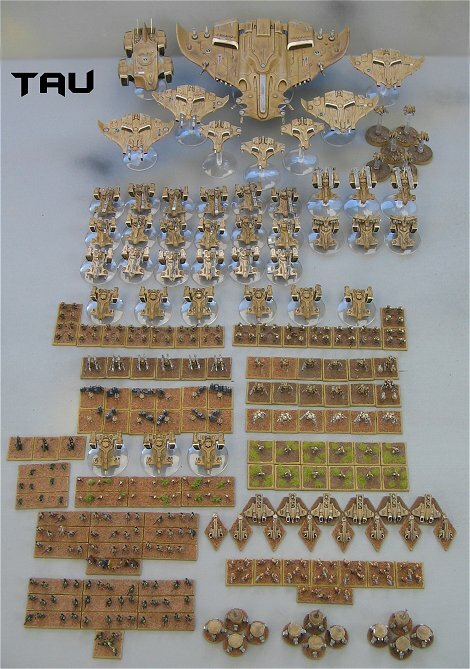 This is my own Tau army (for Epic Armageddon). Here’s a few, more detailed photos of the army. I’ll start with the Core formations. XV8 Crisis Battlesuit Cadres (with Shas’o & Shas’el commanders). 2 Fire Warrior Cadres (I used proxy miniatures from Hordes of the Future as my Fire Warriors, the Devilfish are from ForgeWorld). Now onto the Support Groups. 3 Armoured Mobile Hunter Cadres (Hammerhead gunships from ForgeWorld). XV15 Stealth Battle Suits From ForgeWorld). XV88 Broadside Battlesuits (from ForgeWorld). Scorpionfish Super-Heavy Missile Gunships (Badger miniatures from Reapers CAV range). Stingray Missile Gunships (from ForgeWorld). Recon Skimmer Support Group (Tetras & Piranhas from ForgeWorld). Markerlight Sentry Support Group (Turrets from ForgeWorld, the Markerlight Towers are converted from ForgeWorld Turrets). Kroot Kindred (Kroot Carnivore squads are Dark Realm Miniatures, the Hounds and Krootox are from ForgeWorld). Gue’vesa (human auxiliary forces from Dark Realm Miniatures). Tigershark Squadron and an Orca Dropship (both from ForgeWorld). 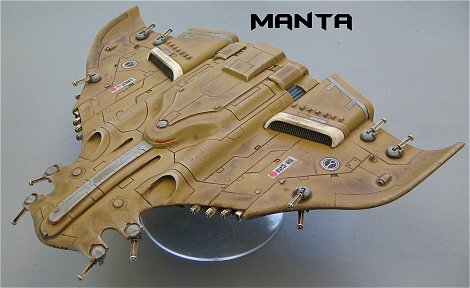 Remora Drone Fighters (These models are actually from Dark Realm Miniatures). My Tau objectives (a crashed Barracuda and an Automated Tau Defence Gun). This army was fairly straight forward to paint. The basecoat is a spray of Model Master Afrika Mustard. The vehicles are then (very lightly) drybrushed with Skull White. Next, certain panels and details are picked out with Skull White. The weapons are painted with Vellejo Light Grey and Skull White. The whole thing is washed using Woodland Scenics Raw Umber pigment. The Infantry are basically the same except different colours have been used to differentiate between formations (making identification easier on the game board). The latest information on the Epic Tau list can be found – HERE.